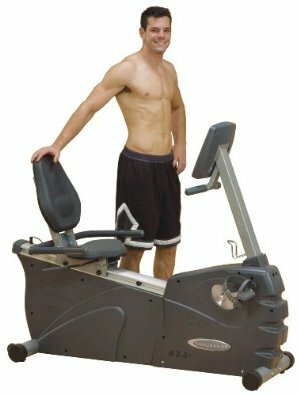 Endurance B2.5R recumbent exercise bike is made for home gyms and provides a low impact cardio. It provides you the constant feedback which will monitor your workout other than contact heart read out. It comes with features like 20 levels of smoothly adjustable magnetic resistance, DuraFirm padding to provide crucial lumbar support and a much more comfortable seat than a traditional road bike. Comfortable Lumbar Support. The non weight-bearing advantage of a recumbent bike is greatly enhanced by the Dura-Firm™ padding with lumbar support featured on the Endurance B2.5R. You’ll be more comfortable extending the length of your workouts, thereby enhancing the cardiovascular benefits of your routines. Frame – heavy gauge welded steel with powder coat textured finish. Seat – Infinitely adjustable recumbent with DuraFirm upholstery and contoured for lumbar support. Fly wheel – 24 pound Precision Balanced. Pedals – Self balancing with strap. Exercise Programs – Hill, Fat burn, Manual, Cardio, Interval, Random. Drive System – Super Silent Poly-V Belt Driven. Workout Feedback Display – 3 LED Segments. Workout Profile Display – 8 x 20 Profile Matrix LED. Heart Rate Technology – Contact Heart Rate Readout. On The Fly Programming – Yes. Feedback – Time, Calories, Resistance Level, Heart Rate, Distance, Speed. Accessory Holder – CD & Water Bottle. Handle Bars – T Bar Style at console and side Support with Contact Heart Rate. ToughTrain 3.0 out of 5 Have average but useful features, now available in a discounted price. Can be a smart choice. *Note: Most of the sites, stores or shopping portals listed above sell Endurance B2.5R Recumbent Exercise Bike with discounts and other exciting offers. There is a possibility that the some of above websites are not selling Endurance B2.5R Recumbent Exercise Bike now. Toughtrain.com is not liable for such cases or instances. Also we do not recommend any seller for Endurance B2.5R Recumbent Exercise Bike and a buyer should buy from where he/she gets best deal with quality of products, service and on time delivery (shipment).